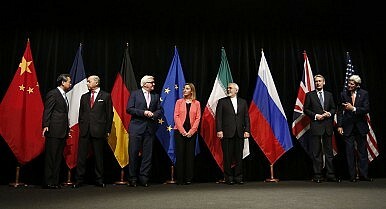 The P5+1, EU, and Iranian foreign ministers celebrate the JPCOA on July 14, 2015. Iranian Foreign Minister Zarif visited China to discuss the future of the relationship once the JCPOA takes effect. Iranian Foreign Minister Javad Zarif arrived in China on Tuesday for talks with Chinese officials, including his counterpart, Wang Yi, as well as Prime Minister Li Keqiang. In their discussions, both sides predicted a bright future for China-Iran relations in the wake of the nuclear deal reached by Iran and the P5+1 countries earlier this year. This was Zarif’s first trip to China since the deal, officially known as the Joint Comprehensive Plan of Action (JCPOA), was finalized in July. The JCPOA calls for Iran to implement restrictions on its nuclear program in exchange for the lifting of international sanctions against the country. Once those sanctions are gone, Zarif sees a bright future for Iran’s relationship with China. “Iran has always regarded China as a strategic partner, and bilateral relations will undoubtedly improve following the Joint Comprehensive Plan of Action,” Zarif told Li during their meeting, according to Press TV. Li agreed, saying that China and Iran could strengthen cooperation in a number of fields after the deal is put into action and sanctions are lifted. With the optimism for their relationship riding on the successful implementation of the JCPOA, both sides took time to emphasize the importance of sticking to the deal. In his meeting with Wang, Zarif expressed particular concern about political opposition to the JCPOA in the United States. In addition to criticism from the Republican-controlled Congress, Republican candidates for president have also threatened not to implement the deal. Assuming the deal does come to fruition, China and Iran have big plans for future cooperation. Wang noted the potential for deeper economic ties, calling the two countries’ economies complementary. Zarif agreed, and pointed out that “Chinese companies will have more chances to cooperate with Iran” once Western sanctions are lifted. Wang also announced that China and Iran have agreed to start regular talks on strategic cooperation, providing a potential forum for coordinating their approaches to regional issues. How did a communist country and an theocracy form a close partnership? Can China Capitalize on Iran's Post-Nuclear Deal Opening? Don't Count On ItWhy China's President Is Heading to IranUS Sanctions on Iran: Good or Bad News for China?What Happens to the Iran Nuclear Deal Under Trump?Is the Iran Nuclear Deal Going to Collapse?